October 29, 2013 is World Stroke Day. Join Jones & Bartlett Learning in spreading the word that stroke is preventable and treatable—tell 6 people that today is World Stroke Day! Perhaps the most startling statistic is that 1 in 6 people will have a stroke in their lifetime. In an effort to educate the public about stroke, preventative lifestyle behavior, and the fundamental need for quality long-term care for stroke survivors, the World Stroke Organization (WSO) launched the “1 in 6” campaign in 2010. This year, the campaign is entitled “Because I care…” and stresses the important role that family, friends and caregivers play in providing encouraging information and supportive care. Know your personal risk factors: high blood pressure, diabetes, and high blood cholesterol. Be physically active and exercise regularly. Maintain a healthy diet high in fruit and vegetables and lot in salt to stay healthy and keep blood pressure low. Avoid cigarette smoke. If you smoke, seek help to stop now. Learn to recognize the warning signs of a stroke and how to take action. According to the American Stroke Association, Stroke is the second leading cause of death in the world, and the fourth leading cause of death in the United States. However, studies show that the public does not rank stroke as a major health concern. Increasing awareness and sharing information with your family and friends could save a life. FAST is an easy way to remember the sudden signs of stroke. If you spot the signs, call for help immediately. 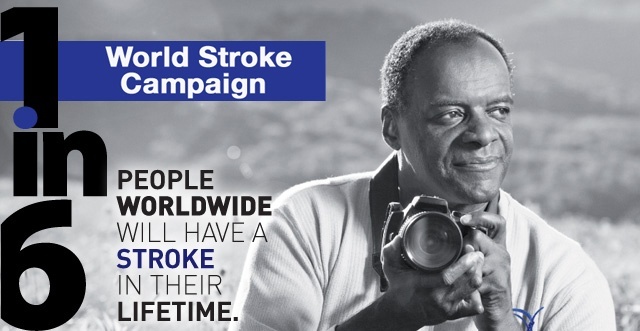 To learn more about strokes and how you can get involved in the World Stroke Organization campaign, visit the WSO website and Facebook page today!